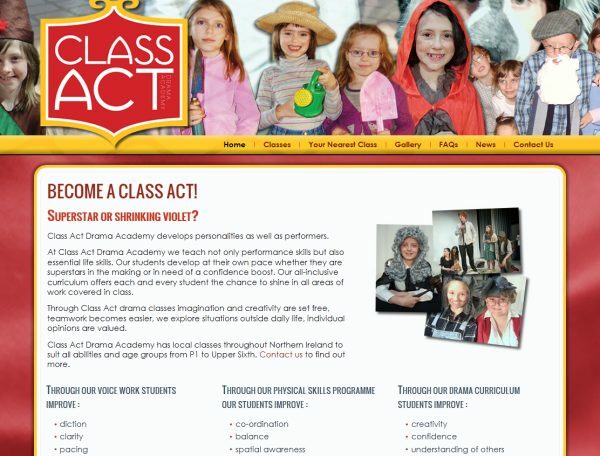 Class Act Drama Academy provide acting classes for children and young people throughout Northern Ireland. As part of developing a new branding identity for the company we produced a content management website which will allow the owners to add regular news stories, photography galleries and make changes to all the different pages of the site. Class Act run drama classes for young people throughout Northern Ireland so one of the neat features we developed for them was an interactive map. The site also allows the company to keep a blog and provide information about what they are up to as well as incorporate facebook and twitter feeds.